Twining’s is sold in over 115 countries, and is the leading premium tea brand in the world. The Twining family originated from Gloucestershire, and often found employment in the weaving industry. Recession in the trade led Daniel Twining to migrate to London with his family in 1684. In 1706 his son, Thomas Twining (1675 – 1741), acquired Tom’s Coffee House on Deveraux Court, at the back of 216 Strand. The shop was well-sited to serve the aristocracy. The Twining tea shop on the Strand, central London. As well as coffee, Twining began to sell the rare but fashionable tea. Twining was supplying tea by royal appointment to Queen Anne by 1711. 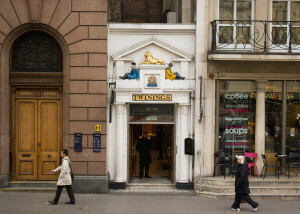 In 1717 Twining acquired the Golden Lyon at 216 Strand: the company still trades from the same premises today. Coffee had been phased out in order to focus on tea by 1734. Thomas’s son, Daniel Twining, took over the business, and by 1749 was exporting tea to America. Between 1762 and 1782 the firm was run by Daniel’s widow, Mary Twining. In 1782 Richard Twining (1749 – 1824) took over the company’s management. In 1784 he advised the Prime Minister, William Pitt the Younger, to dramatically reduce the tax on tea to reduce smuggling. Tea sales subsequently quadrupled. In 1787 Twining introduced its current logo, reputedly the oldest commercial logo to be in continuous use since its inception. In an 1814 letter, Jane Austen revealed herself to be a Twining tea customer. The company also developed a substantial banking arm, and in 1824 it was established as a separate entity. In 1838, Twining received a Royal Warrant from Queen Victoria. It has held a Royal Warrant from each successive British monarch ever since. Twining exclusively used tea from China until 1839, when they also began to use tea from India and Assam. From 1879 Ceylon tea began to be used. From the eighteenth century until the late nineteenth century, staff in the shop wore swallow tail coats and white ties. The Twining bank struggled to compete as rivals grew larger, and in 1892 it was acquired by Lloyds Bank. Twining survived by keeping up with modern developments. Also, Twining & Co was fortunate in that family members who ran the company had all been excellent businessmen. Also, unlike many other tea companies, Twining’s never owned tea plantations, which meant that it wasn’t tied to its own producers, and could select the best tea crops each year. Following the acquisition of the tea interests of Harrisons Crosfield of Bankside in 1916, a private company was incorporated as Twining Crosfield. The company had a share capital of £50,000. It was likely the second largest tea blending company after Brooke Bond. In 1941 part of the Twinings shop and the entire back premises were destroyed by the Luftwaffe. Business continued throughout the war, although the damages necessitated that administration was relocated to Vincent Square in Westminster, followed by the Minories in the City of London, until the premises were rebuilt in 1953. In 1952 Twining became a public company with a share capital of £400,000. The company employed a staff of 450, and had net assets of almost £525,000. Manufacturing premises were at Wellclose Square, with floorspace of over 42,000 sq ft. There were also smaller factories at Belfast and Staffordshire. As well as the Strand location, the company operated shops at Wigmore Street and William Street, Knightsbridge. Twinings undertook advertising for the first time in 1956. This move was prompted by the rise in sales of branded teas such as PG Tips. In 1964 Twining was acquired by Associated British Foods in a friendly takeover. ABF, controlled by George Weston, beat a hostile takeover from Beech-Nut Life Saver of New York, who bid almost £2 million. Beech-Nut had planned to merge Twining with its own Tetley Tea operation. ABF vowed to maintain the business as it had been run before. The main plant in southeast London was struggling to cope with demand. In 1966 production was relocated to a new plant in Andover, Hampshire that cost almost £3 million. Across seven acres, it was one of the most modern automated factories in the world, and employed 700 workers. In 1970 an additional factory was opened at North Shields in the northeast of England. A dedicated marketing manager, Brynley Evans, was brought in from Rank Organisation. In 1973 he became managing director. By the 1970s Twining’s tea had strong sales overseas. Japan and France were the leading export markets, whilst American sales continued to grow strongly, with a 55 percent rise between January and October 1971. Meanwhile the company gained distribution in British supermarkets with its speciality teas such as Earl Grey. By October 1974 Twining was the second largest supplier of black tea in Japan, with 32 percent of the market. Company turnover in 1976 was over £18 million. Between 1969 and 1976, export sales more than quadrupled to £8 million, and Twining was exporting to over 80 countries. The company blended and packed 23 different types of tea. Twining was the biggest British buyer of tea from China. Twining supplied 26 percent of all the tea consumed in France. In 1980 Twining opened a $6 million tea manufacturing facility at Greensboro, North Carolina, its first such plant in America. By 1983 annual export sales had reached £17 million. By this time Twining was a brand leader in Japan. By 1984 Twining was Britain’s largest exporter of tea to America. Earl Grey was the company’s bestseller worldwide. The Greensboro plant was closed in 2005, with the loss of 90 jobs. In 2011 Twining closed their North Shields factory and halved the workforce at the Andover plant, and moved all export production to Swarzedz, Poland. Nearly 400 jobs were lost in Britain. Twining also applied to the European Union for €12 million in investment grants to assist with the relocation, but this was denied. Twining is the second highest selling brand of tea in the UK as of 2016, with a market share of 20 percent.